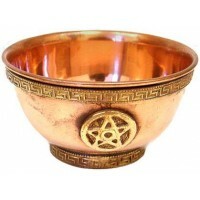 As an offering bowl or even ashtray, this pentacle shaped vessel is a lovely addition to your decor. 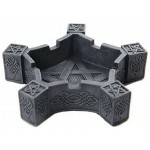 Gray stone finished cast resin bowl, you can use this pentacle bowl on your altar, as an ashtray, or to hold your keys, office supplies, or any trinkets. Measures 5 1/8 in diameter and 1 1/4 inches tall. 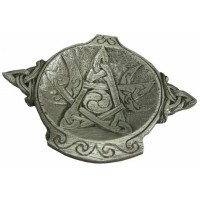 Item Number: PT-10253 | Approximate Size (Inches): 5.18 wide x 5.18 deep x 1.25 high | Approximate Shipping Weight: 1.00 lbs.